Being a Marshalls Project Fab blogger is the best gift ever! This holiday season, the Marshalls team paired each blogger with another blogger for an epic #ProjectFab Secret Santa gift exchange! With $50 we were each challenged to find the BEST GIFT EVER!! - which is really easy to do with the variety of unique gifts available at Marshalls. 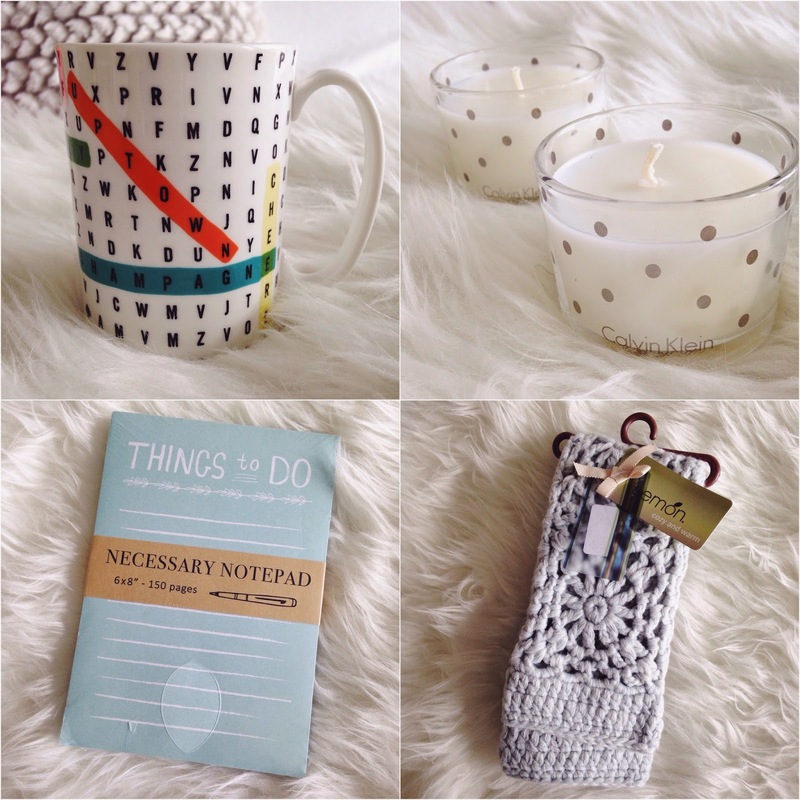 Kate Spade Mug ($12.99, compare at $20), Notepad ($3.99, compare at $6), Lemon Slipper Socks ($19.99, compare at $40.00), Calvin Klein candles in a 'Winter Fruit' scent ($12.99, compare at $20). My vision was for Amanda to cozy up on her couch (kids fast asleep) in these Lemon socks with a warm drink in her Kate Spade mug, Calvin Klein candles lit...preparing her to-do list. Sounds lovely to me! Amanda - I hope you enjoy each gift! My Project Fab Secret Santa was the ever so chic Tamara Marbury from "Blitz and Glam". You may remember her from our fun post collaboration, "One Crop-top, Two Looks". She got me the best gifts! She knew the I've been decorating my home office and thought the Coco Chanel quote and 'Style Style Style' picture would be the perfect complement to my other Chanel picture, and she was right! She also got me a really cute Betsy Johnson black beanie. It's not pictured because it didn't fit my surprisingly large head! I was bummed, but Marshalls' exchange policy is so easy I was able to take it back for a gift card. Tamara - Thank you so much for the thoughtful gifts, and thank you so much to Marshalls for coordinating such a fun project! I hope this post inspires you this gift giving season! Also, be sure to share all your Marshalls' finds on social media with #FabFound - you could win a $50 Marshalls gift card!